Cleaning tile floors usually requires no more than a damp mop and a bit of floor cleaner. Occasionally, cleaner, dirt, grease or other substances build up and make the floors feel sticky. If this is caused by cleaner that has been improperly rinsed off, rinse the floor well with warm water. When stickiness is caused by food or adhesive residue, the cleaning job gets a little more time-consuming and complicated. Sweep the floor to remove surface dust and dirt. Fill bucket with hot water. Add 1 tablespoon of grease-cutting dishwashing liquid per one gallon of water. On vinyl floors, try 1 cup of white vinegar per one gallon of hot water. Dampen a mop in the soapy water. Squeeze out some of the excess water and immediately mop the floor. Grease, juice and other organic substances should easily be removed this way. Check the floor to see if the stickiness is gone. If it is not, try scrubbing with a sponge. If this does not work, the stickiness may be from a non-organic source. Spray WD-40 or a commercial adhesive remover on a small sticky area, but only if the tiles are vinyl, porcelain or laminate. Wait a few seconds and wipe with a damp cloth. If this removes the stickiness, use it on other sticky areas. If stickiness is widespread, try mopping again with hot water. Refill the bucket with clean water. Rinse the mop. Mop the floor with the clean rinse water. Dry with clean towels to prevent water spots. If your tiles are laminate, do not allow water to stand on the tiles before drying them. 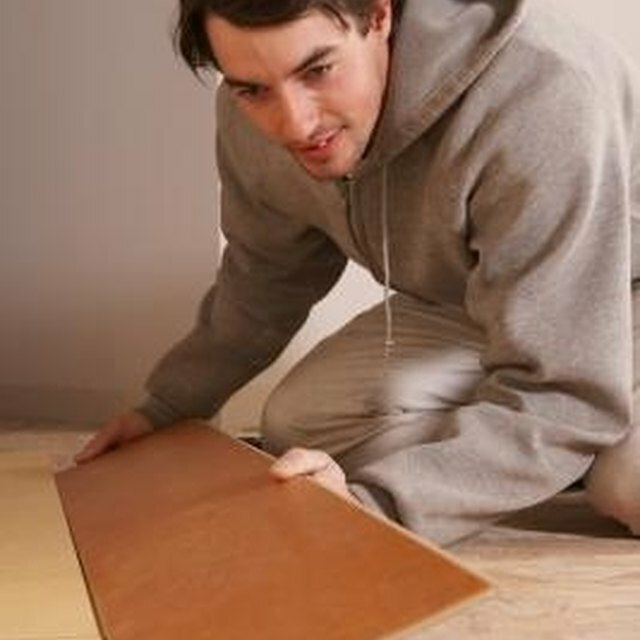 Water may seep down into creases or cracks and warp the laminate tiles. For marble tiles, use a marble-specific floor cleaner.